Yes, it’s another one of those catch-up posts… Internet access has been iffy, and we’ve just been too busy seeing and doing, in all honesty. As we left Braga, there’s a church on the edge of the city, on top of a mountain. 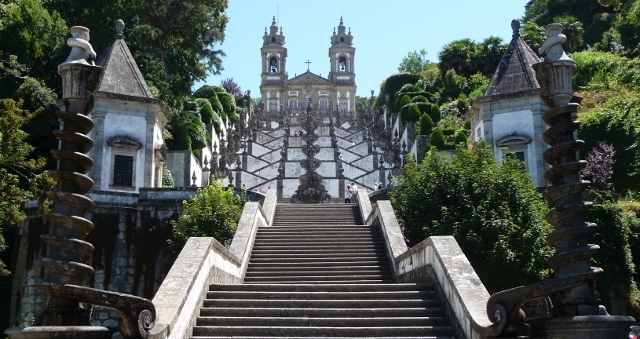 Bom Jesus de Monte isn’t particularly old, it isn’t even particularly big – but it does have a very imposing position, and a spectacular staircase leading to it. 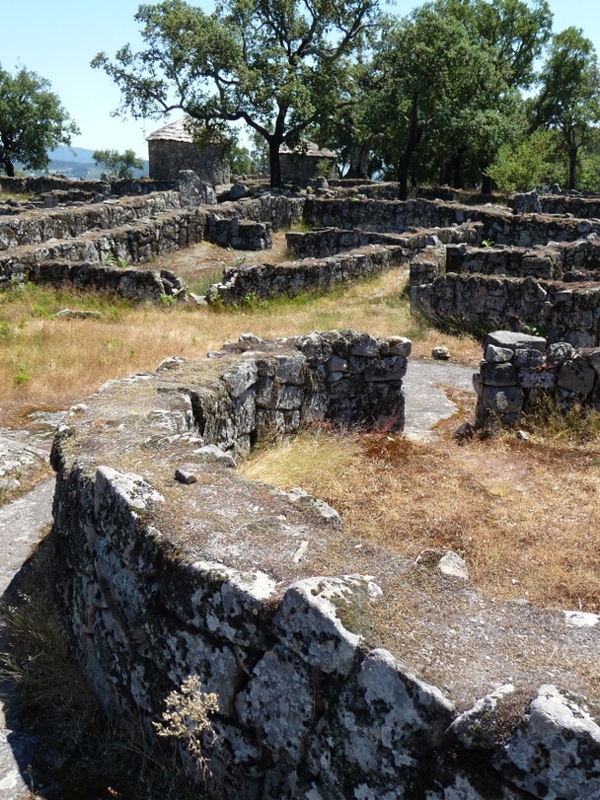 From there, it was time for another spot of pre-history, with a visit to the Citânia de Briteiros. The ruins of a pre-Roman Celtic hill town, this is an absolutely spectacular indication of how advanced the civilisations were, how early – the outlines of the domestic compounds, lining the streets of the town (complete with water distribution culvert, leading from a spring directly to the houses), sit in a naturally fortified location at the head of a river valley, controlling all navigation and animal migration to the sea. Discovered in the late 19th century, the modern village below the site contains an excellent small museum located in the farm where the archeologist who excavated the site, piecing together the culture of the inhabitants, was born. The weather was scorching – well into the 30s, so our wander round Guimãres was a little brief – not helped by the fact that the town appeared almost deserted. For a Saturday, it seemed that virtually nobody was around – either hiding from the sun or making the most of the four-day São João weekend elsewhere. Effectively the birthplace of Portugal, the castle here was where the country was united in the early 12th century, and the first capital (only for a couple of decades, but that’s not what’s important, right…?). The campsite for the town is high on another mountain (Norfolk this ain’t), with a cable car providing the most sensible transport between the two. Because the city was so quiet and so hot, we headed back to the campsite mid-afternoon, to have a little chill out by the pool. Whilst lazing around the pool, we got chatting to a chap – Portuguese by birth, but now living in the south of France (after a few years around Yeovil) – who, with a friend, taught us how to play the local version of skittles/petanques – a heavy metal disk, more like a hockey puck, is thrown at a wooden peg placed about 15 paces away. Points for knocking the peg over, and points for the nearest puck to the peg at the end of the round. As well as the campsite, the mountain’s also home to a large church and a monument-lookout point commemorating a Papal visit – a great place to catch the sunset over the city. The cable car had one neat feature we’ve not seen elsewhere – if you fancy cycling around the wooded areas on top of the mountain, but don’t want to kill yourself getting there, every third or fourth cabin had a bike rack, capable of taking two or three bicycles. The campsite itself was long, thin and steeply terraced – when we’d arrived at the campsite, the motorhome & caravan section looked hugely unappealing – a flat, dusty, featureless, shadeless area just inside the gate. A quick wander, though, found that the areas intended for tents were much nicer – lots of smaller plots on shady terraces. But could we get the van down to them? Yes, we could… Close, but we managed, much to the amusement of onlookers – in place, it looked almost like we’d been airlifted in. So on to the Douro valley – the wide river sheltered beneath steep mountains either side, terraced and lined with Quintas – vineyard estates, producing the grapes that become Port. There’s a road winds down one bank, and a small branch rail line down the other. We can’t vouch for the views from the train, but from the road, the section from Peso de Regua to Pinhão is stunningly beautiful. Then we pointed the van up yet another mountain, towards a lookout point in the heart of a tiny village, way above Pinhão – and stared at the valley and river unfolding for miles. And, of course, some Port had to be tasted, didn’t it? The final stretch of the Douro, in towards Porto itself, isn’t the most scenic – so we succumbed and jumped on the (toll) motorway for a few junctions. We jumped back off again, though, to find the Quinta de Avelada – this time, outside the Port area, producing Vinho Verde. The guidebook had suggested it was worth seeing for the house & gardens, so we thought that, since we’d be passing anyway, we might as well have a little look-see. Sure enough, when we eventually found it (The odd sign wouldn’t go amiss – we ended up in town looking at the streetmap on a bus stop…), the hour or so’s circular walk through the grounds was beautiful. Then it was time to head towards the tasting building. Walking in company with three others, Ellie quickly realised they were Swedes – so, of course, we ended up chatting to them, and the five of us shared a table for the tasting itself. This entry was posted in By Country - Portugal, Travel stuff. Bookmark the permalink. All seems amazing guys, i like the history lessons.